Rainbow's Edge is a small village which contains most of the Nursery Rhyme characters that you have heard about. They spend their time wandering through the village telling their stories. But these stories are not their usual stories. They try to answer some unasked questions and are designed to make you THINK!! ( if you want to use them ) and is graded for difficulty ... the more stars, the more understanding is needed. 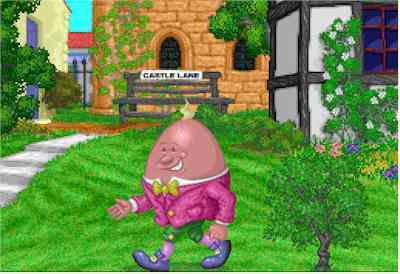 Click on Humpty Dumpty to enter this strange and mysterious world. Can you put the pictures in the right order to make up a story? It's not easy ... but it's fun. Click on Bo Peep or her Sheep for a list of story puzzles.